By Hanna Diskin, 1st Kyu, Age 10. Written October, 2008. Image of Hanna Diskin. Photo by Dru Abrams. Sensei Len was inspired to teach karate because he wanted to see karate developed in Belize to international standards. He started karate at the age of 12, and is Yondan, (4th Dan Black Belt), today. This shows that if you work hard at something you can achieve great things! He trains under his karate instructor, Sensei John Nunez who is also his older brother! 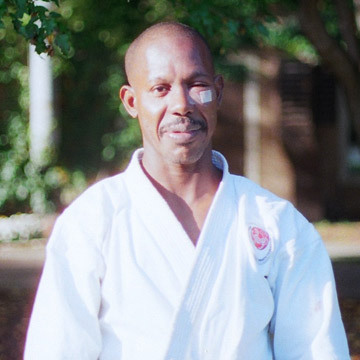 As well as instructing karate, Sensei Len is a schoolteacher at St. Joseph Primary School in Belize City, so you can see he loves teaching children. He says the most important thing he has learnt from karate is self-control, respect and character development, which you need to use outside of the dojo and throughout life. Updates -- Since this article was written, the author, Hanna Diskin, has been promoted to the rank of Shodan (1st dan). Revised August 30, 2009. Updates -- Since this article was written, the author, Leonard Nunez has been promoted to the rank of Godan (5th Dan). Revised August 19, 2015.